Spontaneous and personal encounters and arising communication have a strong impact on work groups. 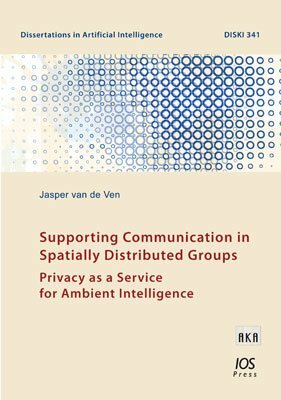 In this thesis, the author develops methods to apply ambient intelligence and qualitative spatial and temporal reasoning to address the spatial gap in distributed work groups. This also contains the problem of privacy in the context of ambient intelligence as privacy is regarded as one of the key acceptance factors. Thus, the aim of this thesis is twofold: the creation of an ambient intelligence proving the ability to support spontaneous encounters and communication in a spatially distributed work setting and an adequate method to ensure privacy in this kind of system in order to increase its acceptance. This cumulative dissertation consists of 6 peer-reviewed papers and one manuscript under review (at the time of submission of this thesis). The contribution of this thesis is a conceptualization of privacy in the context of ambient intelligence including representation, reasoning, and evaluation methods for systems. In addition, an ambient intelligence laboratory is developed. This laboratory is used to address functionality for enabling spontaneous communication in spatially distributed environments and to provide possibilities to investigate ambient intelligence and related systems.